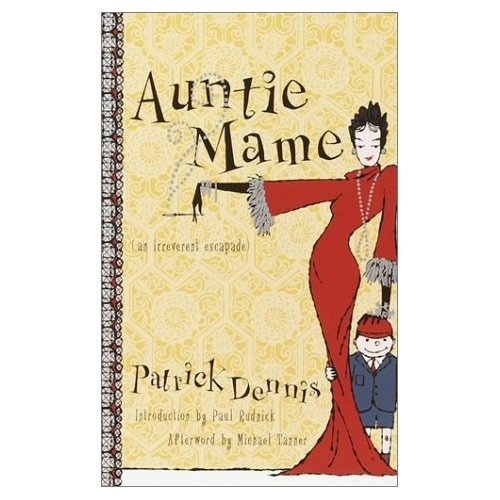 Auntie Mame by Patrick Dennis is a wonderfully humorous memoir. Published in 1955, the popular book was made into a play and at least two movies. My all time favorite is the 1958 version with Rosalind Russell as the lovable, adventurous, unorthodox aunt of 10-year-old Patrick Dennis. The story begins when Patrick is orphaned and sent to live with his only living relative, Auntie Mame. Mame is a character to end all characters. Her rich enthusiasm for life attracts all sorts of people and experiences. She is someone who is fascinated with people and ideologies and embraces them wholeheartedly often going overboard with her ever-changing obsessions. In his will, Patrick’s late father appointed a dark overlord trustee whose views on child rearing and education are the exact opposite of Auntie Mame’s. The battle of wills between the trustee and Mame are priceless. The book is very entertaining and quite funny. The movie scripts stayed very close to the original story. There are a few differences which make the story and Auntie Mame all the more lovable. I think this book will definitely bring a smile to your face. This entry was posted in Uncategorized and tagged Auntie Mame, Books, Patrick Dennis, Rosalind Russell. Bookmark the permalink. 1 Response to You Coax the Blues Right Out of the Horn….